Join us for a fun evening and try out your rock-climbing skills. All levels welcome. Lessons on belaying and lead belaying will be offered. Cost includes day pass, lesson and equipment (except for shoes, which can be rented). Wednesday, February 8, 2017, 6:30 - 8:30 P.M.
Pre-registration is now closed. Please contact Chi Bui at orthochi@yahoo.com for late registration options. 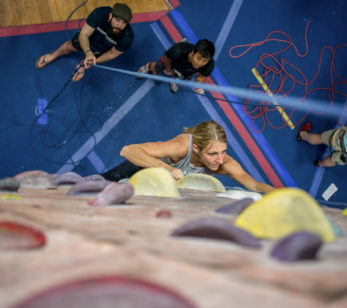 To keep up with the demands of the ever-growing climbing community, we strive to keep our facility up-to-date whether that means newer and better cross-training equipment, new walls and auto-belays, various offerings in fitness and yoga or different and unique styles of route setting. We try to give our members something new to explore and a community in which they feel comfortable pushing their boundaries with all the right tools to train safely and effectively.